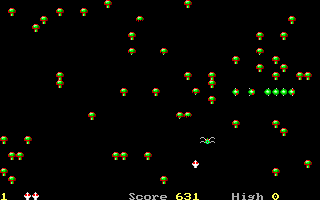 The game was originally created by Atari in 1980 and called “Centipede”. Richard Ottosen, Bill Bailey and yours-truly made a version soon afterwards that ran on the Apple II computer in text mode. This is a resurrection of that version using graphic sprites.